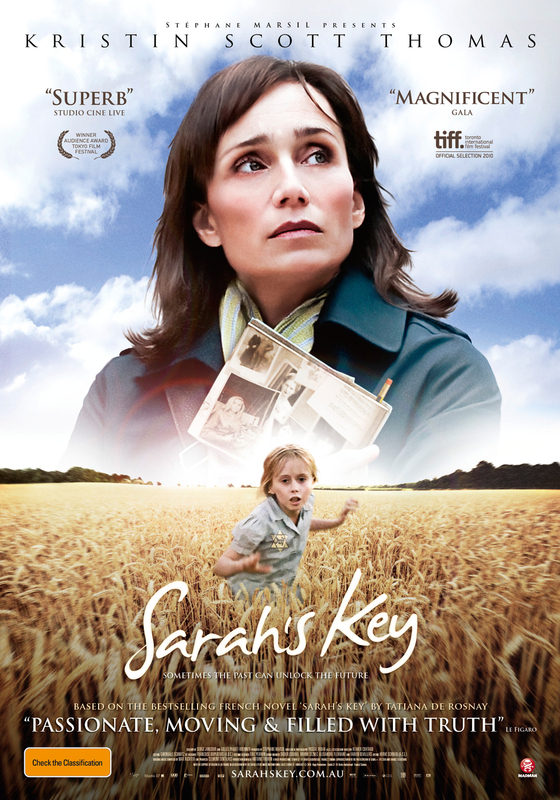 Sarah's Key is one of the best, and also the saddest, movies I have seen in quite a while. Readers of the novel on which the film is based say that it's fantastic, and so I had high hopes for the movie as well. I was not disappointed. Sarah Starzynski (Mélusine Mayance, "Ricky") and her family live in Paris, and are Jewish. In July 1942 they are rounded up with the rest of the French Jews and sent to a detainment camp. Her parents are sent on to a concentration camp, but for some reason the children are left behind for an additional week. Sarah and her friend are able to escape, and they take refuge with a French couple in a village, who later ends up raising Sarah as one of their own. Sarah must first return to Paris, however, to rescue her brother Michel, whom she locked in a closet in her family's apartment, in the hopes that he would be saved and not included in the round-up. Meanwhile, in the present day, Julia (Kristin Scott Thomas, "Nowhere Boy") is about to move into a new apartment with her husband. The apartment has been in the family for decades - since August 1942, in fact - and Julia slowly learns how the family "acquired" the apartment after the Starzynski family was arrested. She becomes obsessed with finding out Sarah's story and whether Sarah is still alive now, and her journey takes her to New York and Italy, among other places. What she finds will impact her in the present day, and she must have the courage to decide what she wants to do once she learns this information. Definitely see this movie. The film is mostly in French with English subtitles, although Julia's character knows English as well - she came to Paris by way of New York City, where she grew up - and so some of the scenes are in English. The movie flips between the present day and the past, when Sarah is in the detainment camp and after she escapes, and although those scenes are stronger than the present day ones, they are equally interesting. Some of the scenes in the detainment camp are filmed in a haphazard, frantic way, much as the way the detainees must have been feeling at the time, and this helps contribute to the mood of the film. There are a few scenes in particular that will not be easy for moviegoers to forget, and these are what helps to make Sarah's Key one of the best Holocaust-related movies I have seen in quite a while. Sarah's Key will be playing locally at the Birmingham 8 theater, starting today, July 29th, and is rated PG-13.